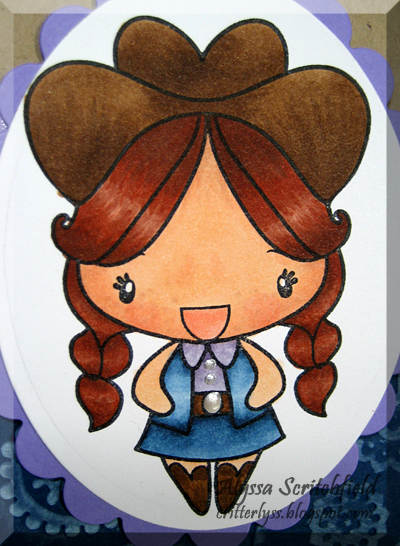 Today, I bring you Wild West Anya. She was generously gifted to me from our previous DT member, Linda. I thought she was just perfect for the iCopic Weekly Challenge #49 - Red Hair. I went with the reddish browns for my red hair colors - E17, E19 and E27. Her skirt and vest are in classic blue jean colors - B91, B95, B97 and B99. Her buttons and buckle are covered in liquid pearls. (Yes, again! I can't seem to get enough of these things!!) They just remind me of pearl buttons on western style shirts, so I had to do it. I used a paisley embossing folder as the base and swiped white ink over the raised parts...just like a bandana! 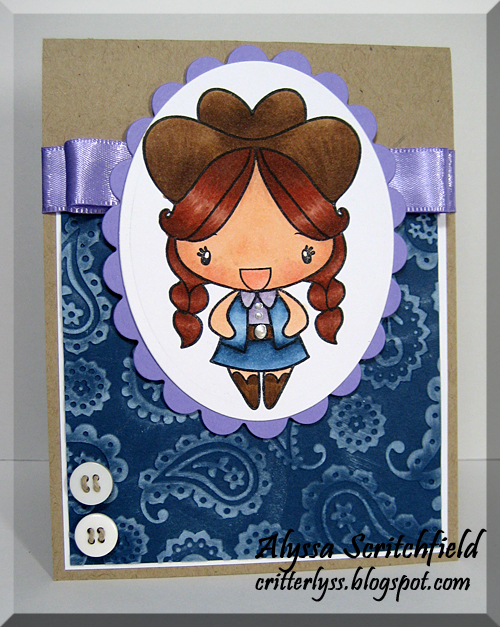 A simple layout and this little cowgirl is ready for anything! Sorry for the lack of chit chat! This is super cute - love the embossing folder you chose to go with this little Greeting Farm stamp! Love the ribbon too! Adorable! I love the paisley background and your coloring!